Steve Ritchie was born in Reidsville, North Carolina, where he was an early football and academic standout. Despite broken legs in the eighth and ninth grades, (and after being told by a bone specialist that he would never play football again), he played 7 more years and was a star quarterback in high school. Gaining admission to the U. S. Air Force Academy, he continued in athletics. Beginning as a "walk on" in 1960, he became a starting halfback for the Falcons in 1962 and 1963, with his final game in the 1963 Gator Bowl. Graduating from the Academy with a Bachelor of Science degree in 1964, Ritchie entered pilot training at Laredo Air Force Base, Texas, and finished number one in his class. (AFAA President Frank Gailer was Wing Director of Operations at the time and gave Ritchie two check rides. Asked by one of his instructors how the young pilot trainee had done, Gailer replied, "I learned a lot.") His first operational assignment was with Flight Test Operations at Eglin AFB, Florida, where he flew the F-104 Starfighter. Two years later he transitioned into the F-4 Phantom II at Homestead AFB, Fl in preparation for his first tour in Southeast Asia. Assigned to the 480th Tactical Fighter Squadron at Danang Air Base, South Vietnam in 1968, Ritchie flew the first "Fast FAC" mission in the F-4 forward air controller program and was instrumental in the spread and success of the program. Returning from Southeast Asia in 1969, he reported to the Air Force Fighter Weapons School at Nellis Air Force Base, Nevada, where at 26 years of age, he became one of the youngest instructors in the history of the school. Ritchie volunteered for a second combat tour in January 1972 and was assigned to the 432nd Tactical Reconnaissance Wing at Udorn, Thailand. Flying an F-4D with the famed 555th ("Triple Nickel") Tactical Fighter Squadron he joined the ranks of the MiG killers when he downed a MiG-21 on 10 May, one of several Air Force aerial victories that day. He scored a second victory on 31 May, another MiG-21. A classic low-altitude dog fight on 8 July tied Robins Olds' five-year-old Southeast Asia record as two more MG-21s fell to his Sparrow missiles. Then, on 28 August, came the mission that propelled Steve Ritchie into the record books. Leading Buick Flight, four F-4D Phantoms performing Air MiG CAP ( Combat Air Patrol) north of Hanoi, it was Ritchie's job to protect the Strike Force coming in from the Southwest to hit the Thai-Nguyen steel plant. After a short period of calm, suddenly Disco, the forerunner of AWACS (an RC-121 radar control aircraft orbiting over Laos), came on the radio warning of "bandits" approaching from the northeast. Ritchie turned his flight in that direction, but the radar blips faded and disappeared. Turning back south, Ritchie received another call from Red Crown (a Navy radar ship off the coast): two MiGs are airborne and heading for the Strike Force at high speed - distance, 60 miles. As Buick Flight turned toward the west, Red Crown called again: "Blue Bandits (Mig-21s), are now RTB (Return to Base [Hanoi]), 12 o'clock at 40 miles and closing." Pushing the throttles forward, Ritchie closed the distance to 15 miles. Capt. Charles DeBellevue, operating the airborne radar from the back seat, secured a radar lock-on and began calling off range to target: "Seven miles - six - five - three-and-a-half - two." Red Crown called again, "Bandits at 2-3-9." "I got 'em, I got 'em - Buick has a Tally Ho! "Ritchie shouted. As the MiGs crossed from right to left, Ritchie jammed the throttles into full afterburner and pulled the massive Phantom into a hard left turn. During this maneuver, as the range to the MiG increased to three miles, he fired the first two Sparrow missiles. "Out of range - out of range", called DeBellevue. Accelerating to 1.2 Mach, Ritchie closed the distance to the MiG-21s, now dead ahead, and fired the last two Aim-7s as the MiGs slipped into a thin overcast. Twenty seconds later, the lead MiG, now in range, popped out of the overcast as one of the Sparrows flashed by his left side. Breaking right to evade, the Fishbed pilot flew directly into the path of the second Sparrow. And Steve Ritchie joined the ranks of America's fighter aces. 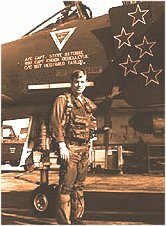 After completing 339 combat missions totalling over 800 flying hours, Ritchie returned from his second combat tour as one of the most highly decorated pilots in the Vietnam War, having received the Air Force Cross, four Silver Stars, 10 Distinguished Flying Crosses and 25 Air Medals. His combat achievements also brought him the 1972 "Mackay Trophy" for the most significant Air Force Mission of the Year, the Air Force Academy's 1972 Colonel James Jabara Award for Airmanship", and the 1972 Armed Forces Award, presented by the Veterans of Foreign Wars for outstanding contributions to the national security of the United States. In 1973 he was selected as one of the "Outstanding Young Men of America', and in 1974 received the Eugene Zuchert Award from the Civil Air Patrol. Also in 1974, at the urging of Senator Barry Goldwarer, he resigned his regular commission to run for the U.S. Congress in his 6th District of North Carolina. Unfortunately, he ran as a Republican against a popular Democrat incumbent, in the South, during Watergate, right after Vietnam! Joining the Colorado Air National Guard (and, later the Air Force Reserve), Ritchie continued military duty, while pursuing a civilian career. Moving to Colorado, he worked as special assistant to Joseph Coors, President of Coors Brewing Co. for six years before forming Steve Ritchie Associates, Inc., a Nevada-based communications company. In 1985 he was appointed Director of the Office of Child Support Enforcement, reporting to the Secretary of Health and Human Services in Washington, D.C., and two years later joined Barlows, Inc., of Falls Church, VA, as vice-president of business development. In 1987 he was assigned to the Mobilization Policy and Plans Directorate of the Office of the Secretary of Defense. In 1989, Ritchie became vice-president of Denning Investments in Palo Alto, CA and two years later was elected president of the American Security Council and Foundation, based in Washington, D.C. Promoted to brigadier general in the Air Force Reserve in 1994, he became mobilization assistant to the Commander, Air Force Recruiting Service. Over the next six years, he traveled across our country, speaking to approximately 1100 audiences in support of Air Force recruiting efforts, a strong national defense and America's market system. In addition, he flew over 100 airshow performances in the T/AT-38 Talon to help counter today's pilot shortage and recruiting deficit.